The first week of school is coming to a close in Nashville, and there is a temptation to call it a successful one. If you ignore the delay with the opening at Overton HS and a few other issues, you could make a strong argument for a smooth opening. But at what cost? This is the first year in a long time that school opened with a full day followed by a full week. In talking to teachers and perusing social media, I get the impression that this has not made for an easy week for our teachers. Many of them have expressed being tired already. Teaching is not only a physically challenging job, but also has a mental component as well. Staying on top of and engaging children 7 hours a day is no easy feat. Prior to the first week of school, teachers will get together and plan for the first couple of weeks of school. They’ll do this with only a basic knowledge of the students they’ll be responsible for. Then the first day comes and they assess the students in their classes. Sometimes lesson plans will match up, but other times they’ll have to be adjusted based on their students’ needs. Previously, the day after the first day of school was a day off for students and an inservice day for teachers. That free day after the first day allowed time for those changes to be made as well any additional professional development that might be applicable. This year there was no inservice day, and therefore teachers had to adjust while still sorting through schedules, class assignments, and trying to deliver meaningful instruction. You ever try to work from home while the kids were there? Then you understand the challenge. I look at teaching and the school year as akin to running a long distance race. When I start out on a run, I don’t sprint right out of the gate. I ease into it and make sure that I’m spreading out my effort in a manner that allows me to maintain a consistent pace for the whole distance. Run too fast at the beginning and I run the risk of pulling up lame before the end of the race. Leaders have a responsibility to their charges to set them up for success. I’m not sure that this year’s school calendar meets that criteria. We must not lose sight that it’s not the beginning of the race that determines the winners but rather how they finish. Godspeed to you teachers and thank you for always rising for the bell. Your strength and dedication does not go unnoticed nor unappreciated. Another quick note on teachers. Look at the current job listings for MNPS and it looks like the district is still short 150 certificated classroom employees. I’m also hearing of high schools with classes as big as 41 students. I’m not a teacher, nor do I play one on television, but to my ears that sounds more like crowd control than teaching. 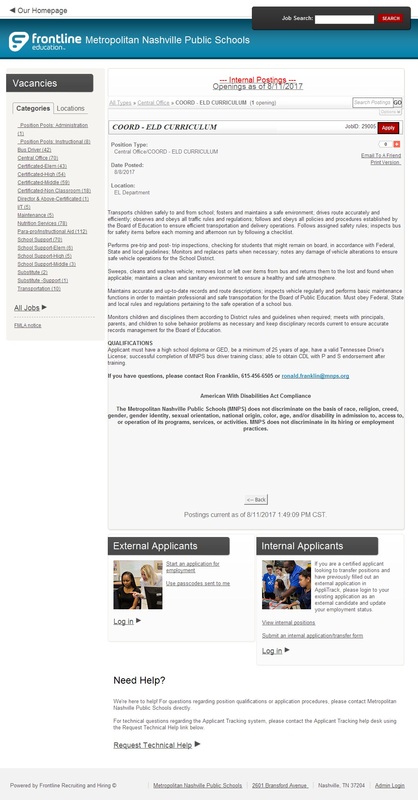 It should be noted that it is really hard to keep track of exactly how many openings MNPS has when their online job listing site isn’t properly maintained. Positions often stay posted long after they’ve been filled. Then there are listings like the one shown here for an EL coordinator. Guess the candidate better brush up on their bus driving skills, or better yet, maybe HR needs to brush up on their cut and paste skills. The two top positions in Human Resources are held by women whose background is in healthcare. They are sharp, hard working women, but if I was recruiting for a football team would I be utilizing chemists to help me find potential players? Or would I employ people with experience as players? People who have a deep understanding of the challenges and have access to networks of players and the ability to sell those players in a common language that could ease any concerns about joining my team. Rumor has it that a number of positions in HR will soon be filled by former St. Thomas Hospital staffers. I say that’s great news if we are looking for doctors and nurses. But what do I know? The top of the list of things I don’t want to write anymore about is Eclipsegate17. 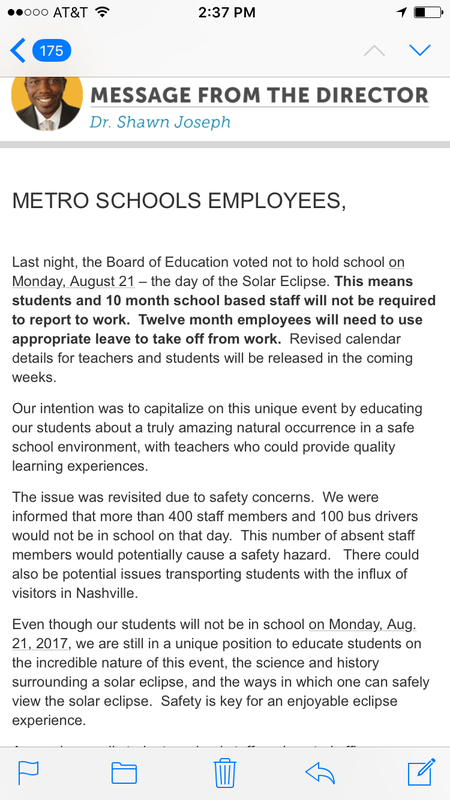 In case you weren’t paying attention, this week the school board voted to reverse a decision that reversed an earlier decision and close schools on August 21st. To be clear, at this point I think the decision to close schools was the only logical choice for the board. Especially in light of the head of MNPS’s STEAM initiative Kris Elliot’s imminent departure. But that it got to this point is mind boggling to me. There is no reason that a decision couldn’t have been made and adhered to back in September 2016, when the 2017-2018 calendar was being created and approved. I have heard some people try to compare this to an inclement weather day. Nothing could be further from the truth. A weather day is an unpredictable occurrence. The solar eclipse was predicted about 100 years ago. There is no information available today that was not available at any time during the past nine months. So to compare it to a weather day is like comparing apples and limes. One of the most concerning aspects of this incident to me is the ultimate reason why school that day was canceled. In a message to district employees, director of schools Dr. Joseph acknowledges that 400 teachers and 100 bus drivers would be out that day, so safety had become an issue and therefore we were canceling. In other words, y’all weren’t coming, so we didn’t see any sense in holding classes. That’s a little alarming. Do not think that logic went unnoticed. I’ve already heard rumblings about what’s going to happen the Friday of TSU’s homecoming this year. Traditionally that is the district’s highest absentee day of the year for staff. Last year, the strategy was to employ central office folks to cover for absent classroom teachers. But that begs the question of who’s doing central office folk’s jobs that day? Unless of course….. well, you get the picture. Nashville Blogger and Education Post contributor Vesia Hawkins has some additional thoughts on Eclispegate17 over at her blog Volume and Light. As a side note, many criticize Vesia because she’s a paid contributor to Education Post, but let me be clear, if anybody wants to pay me, I’m not necessarily opposed to it. The wife would be even more appreciative. Paid doesn’t equal bought. Don’t consider that an endorsement, though, because at the end of the day every individual has to answer that question for themselves. I’m debating getting T-shirts made up for school board members with that saying embossed on the front. On the back I could print an Einstein quote: “You are what you do, not what you say you will do.” Too much, you think? Here’s a bit of free career advice. If you are the principal of a large high school that has seen teacher turnover above 65% in the last year, it’s probably not a good idea to go to a cigar bar and brag loudly about the number of people you’ve run off. Just saying. You also probably shouldn’t make the language as colorful either. Again, just saying. Parent U is this weekend. 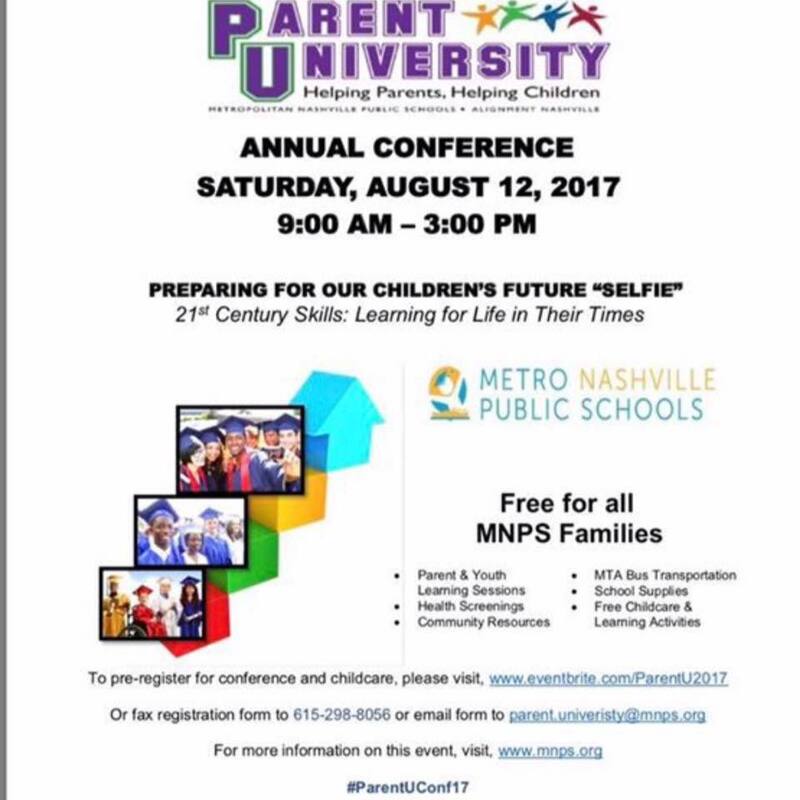 This is a great opportunity for parents to learn more about what goes into their child’s education. If you think that you are a well informed parent and that there would be nothing here for you, think again. There are programs scheduled for all levels. It’s a good time and I urge you to put it on your calendar. The lunch room has changed a lot since I was a kid. It just keeps getting better and better all the time. This year, MNPS’s Nutritional Services changed their employee schedules from a 6-hour day to a 7-hour day. This is a big deal because not only does it give them more prep time, but it also sends a message that they are valued employees. Wouldn’t hurt to have a lot more of that kind of affirmation going around. A salute to MNPS Nutritional Services. 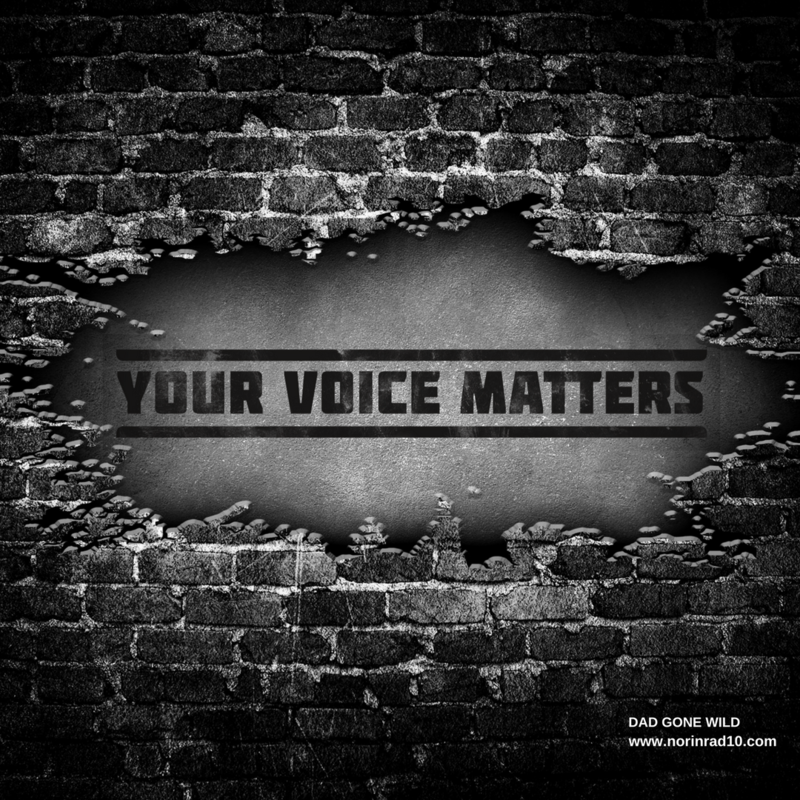 Andy Spears over at the Tennessee Ed Report has an excellent post on the recently released poll of teachers statewide conducted by the TNDOE. Apparently teachers are warming to the state’s evaluation tool, but “Sixty-five percent of educators surveyed said standardized exams aren’t worth the investment of time and effort. The same percentage of teachers said the exams don’t help refine teaching practices.” Jason Gonzales of The Tennessean wrote the initial piece on the survey and it’s equally good. If you see JT Moore Principal Gary Hughes… say Happy 50th! If you see new Public Information Officer Michelle Michaud around, try to make her feel welcome. Rumor has it she may be a keeper. Also kudos go out to former Rose Park Magnet Math and Science Middle Prep Principal Robert Blankenship. I say former, because he’s been named the new Director of STEAM initiatives for grades K-12. I know, you thought there was a policy in place to prevent these types of transitions during the school year and that some of you principals were actually following that policy. But by now, you should know that in MNPS we pride ourselves on building the airplane as we fly it. Congratulations Robert, no reason to believe you won’t do great work. A Friday post wouldn’t be complete without some questions. Today I would like to know what your impressions are of the first week of school. Did you like the new schedule or do you wish things would revert to the old schedule? Secondly, do you think things went smoothly or were there a lot of issues? The third and final question is meant in jest because well, I couldn’t resist. What other day do you think the administration should go ahead and cancel because teachers and bus drivers aren’t planning on showing up? Surely you have some suggestions. The first week of school is now officially in the books. Onward and upward. As always, if you have thoughts you’d like to share, positive or negative, drop me a line at norinrad10@yahoo.com. Also be sure to check out the Dad Gone Wild Facebook page for lots of positive vibes. Like it if you can. Previous A GOOD FIRST DAY, BUT NOW THE WORK BEGINS. Here’s what I’m wondering: Is Sept. 1 still a PD day for teachers with no school for students? I have seen no mention of that in the recent press releases. Your column would be more well received and useful if your feedback were more balanced. As it is, you are way too critical so it is easier to tune you out. Please be more balanced. In a group I’m in, people are advised to give feedback like a ‘sandwich.’ Start with the positive. Then give constructive criticism. End with the positive. It works and is heard. Plus, why isn’t your name on your column? I appreciate the energy and effort your column reflects. That’s also known as the Oreo cookie and studies have actually shown it to be ineffective. I appreciate the feedback and do actively look for positive news however I find it rarer then it should be. Please pay attention to Monday’s story on Channel 5 about the districts response to lead in water. That story leads me to believe that I’m not critical enough because their response is horrific. As my far as my name being on here, I’m not what you mean. My name is on posts as well as my email. I’ve never tried to be anonymous. Thanks for the feedback.